The Vegas line had the Kansas City Chiefs holding a 2 point edge over the Pittsburgh Steelers heading into the January 2017 AFC Divisional playoff game. The book makers favoredthe Chiefs despite the fact that Steelers held a 20-11 advantage in the series, including a 10-7 edge in games played at Arrowhead Stadium, a notoriously difficult place to play. But all of those were regular season match ups. The Steelers and Chiefs have played in the playoffs once, with the Steelers losing in overtime. That game came after the 1993 season, when James Harrison struggling to hold down a practice squad slot…. (Ha! fooled you didn’t I?) That’s a joke about Harrison, but the game was so long ago that it DOES precede Steelers defensive line coach John Mitchell’s time with the team, as Bill Cowher fired Steve Furness after that playoff loss. How have things worked out since that fateful day when a Mark Royals’ blocked punt opened the door to another Joe Montana comeback? Well, per Dale Lolley, the Chiefs are 0-4 at Arrowhead since that win and 1-9 overall in the playoffs. The Steelers in contrast are 19-12 in the playoffs since that day. The bottom line is that the Steelers and Chiefs don’t have a lot of playoff history so perhaps the operative metric should have been Mike Tomlin’s record against Andy Reid. Not including Steelers and Eagles annual preseason match ups, Mike Tomlin is 5-2 against Andy Reid. Tomlin’s games against Reid came in 2008, 2012, 2014, 2015, the 2016 regular season, 2016 playoffs and the 2017 season, which provides a fairly good cross section of both coaches work. In 2008 the Steelers and Eagles were both contenders, and the Eagles dominated Pittsburgh in that game but the Steelers went on to win Super Bowl XLIII. By 2012, both the Steelers and Eagles were in re-building phases as the Steelers prevailed at Heinz Field. In 2014 both the Steelers and Chiefs were fighting to establish themselves as playoff contenders. The Steelers got the better of that December 2014 tussle, while the Chiefs stayed home in January. By 2015 and 2016 both the Steelers and Chiefs had reestablished themselves as contenders. In fact, Tomlin’s last victory against Andy Reid came in October at Heinz Field as Le’Veon Bell, steamrolled the Kansas City to the tune of 43-14. Tomlin’s last loss to Andy Reid came in October 2015, with Ben Roethlisberger injured and Landry Jones making his first, unsuccessful, start. At the time it was viewed as a “Tomlin Trap Game” but the Chiefs went on to win 11 straight. As recently as January 2017, those two games perhaps, ominously, highlight the operative trend in Mike Tomlin’s record against Andy Reid. 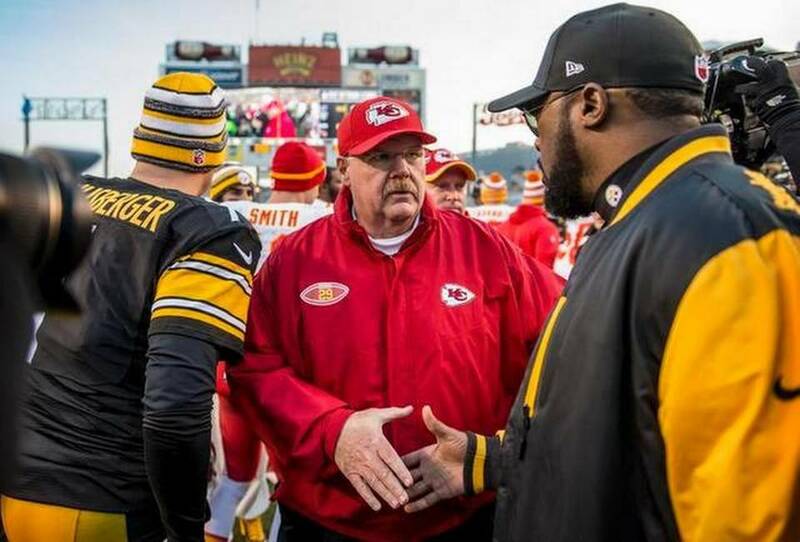 At the time Mike Tomlin was 3-0 against Andy Reid at Heinz Field, but Andy Reid had never lost to Mike Tomlin at home. That changed in 2016 as Le’Veon Bell and Chris Boswell led the Steelers to a narrow playoff win against the Chiefs at Arrowhead. And in 2017 the Steelers again returned to Kansas City, where the Steelers vanquished the Chiefs to the tune of 19-13. Going into Pittsburgh’s 2018 home opener, the Steelers hold a 23-11 edge of the Chiefs and their edge improves to 11-4 while playing in Pittsburgh, where Kansas City has not won since 1986. This entry was posted in Steelers 2016 Playoffs, Steelers History and tagged Ben Roethlisberger, Bill Cowher, Bud Dupree, James Harrison, Johnny Mitchell, Lawrence Timmons, Le'Veon Bell, Mike Tomlin, Pittsburgh Steelers, Ryan Shazier, Sean Davis, Steelers vs. Chiefs, Stephon Tuitt. Bookmark the permalink. Wouldn’t It Be Nice If Terry Bradshaw Made Up with the Steelers. For Good…? As a heavily biased and incredibly over-opinionated die-hard KC fan I expected this to be the same thing I’ve been reading and listening to all week. The pundits and writers complete expectation to see the Steelers just roll on a finally (Dear, sweet baby Jesus… let Houston be 100%) healthy KC squad. But, as I read I found it to be a very unbiased take that offered objective points to give a real idea of the team makeup at the time. Nice read. Now that we’re through with the pleasantries, back to stoopid fandom… Your team is garbage and you should all be ashamed. Wow! Thanks for the kind words. That’s why they play the games ! Go Steelers!